When it’s too hot to contemplate soup, keep your cool with this easy salad recipe that channels the flavors of the Eastern European soup borscht. It's made even simpler with the SpiraSlicer, which makes quick work of all the chopping. This earthy blend is crisp, tangy, and highly satisfying, no matter the temperature outside. This salad is perfect for a picnic or potluck because it tastes better after it sits in the fridge for a while and all the flavors get to know each other. It's also got beautiful, vivid colors that look great on a spread. Did you know you could use your SpiraSlicer as a shredder? 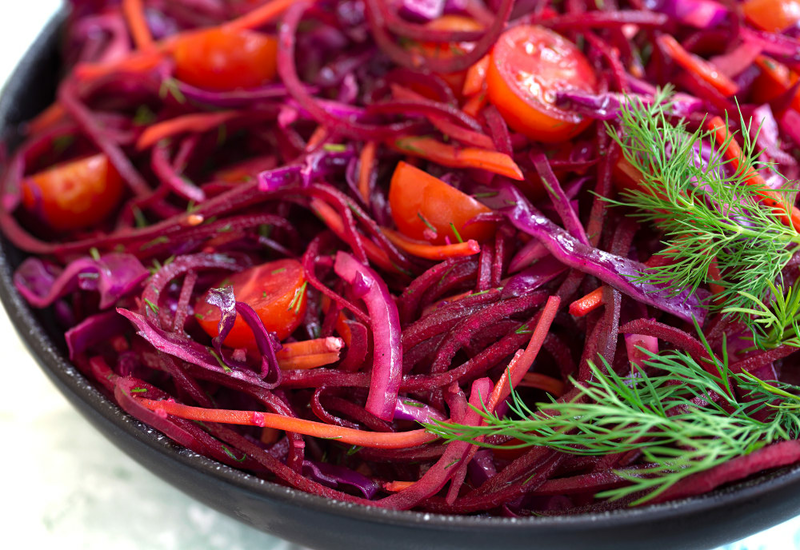 Run the carrots, red onion, and cabbage through it right after the beets. You won’t get long strands, but for this application, those shorter pieces will be perfect! This salad does best when refrigerated briefly, but it can be served immediately. It will also keep for up to a day in advance. Per Serving: 77 calories; 5g fat; 7.2g carbohydrates; 1g protein; 0mg cholesterol; 164mg sodium. this is such a cool idea! i got a new spiralizer and have been looking for fun new ways to use it. this vinegar-y, borscht-inspired salad is so crisp and refreshing. will def make again. This salad has incredible flavor! I added goat cheese and a hard boiled egg for added protein. It was so much better than expected.